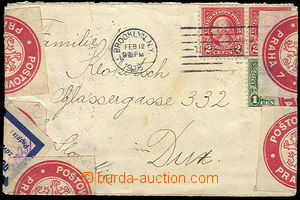 1918? AUSTRIA Žebrak-Žebrák complete. sheet žlutých Reg labels No. 51-100, yellow, divided, perforated, in the middle folded, fold, first hinge partially detached. 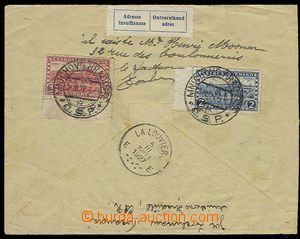 1924 card to Switzerland on/for main post in/at Geneva, nevyzvednutý, label Non reclamé, after/around month sent back, MC Brno 2/ 1.VII.24, arrival GENÈVE Poste Restante 3.VII.24 and departure postmark 12.VIII.24, nice. 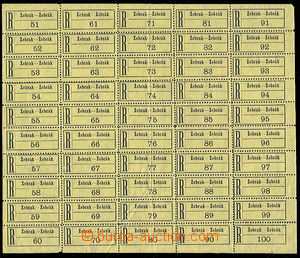 1966 CZECHOSLOVAKIA 1945-92, corner blk-of-6 special Reg labels National exhibition post. stamps Brno 1966, mint never hinged. 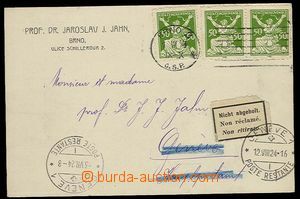 1949 CZECHOSLOVAKIA 1945-92, Reg letter with Pof.499, 2x 504, placed, unlifted, sent back with label Unclaimed, MC Prague 015/ 17.VIII.49, incl. content, good condition.